The document was adopted by the Russian Orthodox Church’s Holy Synod at its meeting on December 25-26, 2013 (Minutes No. 132). The last months of the outgoing year 2013 have been marked with disorders in Ukraine which have caused our profound concern and raised painful echoes in the united multinational and millions-strong Russian Church. We sincerely wish reconciliation to various ethnic and social groups and adherents to various political views. We recall the Lord’s call to us through St. Paul: “If it is possible, as far as it depends on you, live at peace with everyone” (Rom. 12:18). The unity of the Church is above political borders. 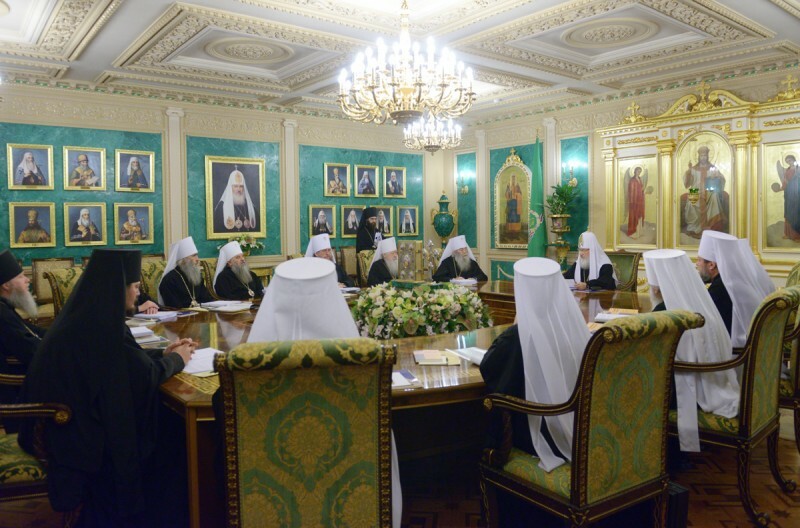 The Russian Orthodox Church takes special care of the spiritual community which seals the nations that have come out of the same baptismal font of the Holy Prince Vladimir Equal-to-the-Apostles. The united Russian Church has been built for over one thousand years. We have inherited this spiritual unity from our ancestors and must hand it over to our descendants. Having once brought the united nation to the Dnieper font, the Lord Himself pointed for our devout ancestors the way of spiritual unity that surpasses human divisions. For this reason, we would like to remind all that the desire to split the Church for political reasons is a grave sin. We are aware that Ukrainian citizens have different views of the future of their country and we respect the right of the Ukrainian people to choose their own way. But it is very important that it should be precisely people’s choice, free and based on the awareness of all the pros and cons, not dictated by any external will. Let adherents to different versions of this choice speak with the people through peaceful and legitimate public processes and through a calm and responsible dialogue with each other. The Church is ready to assist different social groups in this dialogue and in a search for right decisions. However, it is our conviction that no right decision can be found in a fit of hatred and mutual anger. The 20th century history has clearly shown that a civic discord, the more so a revolution, cannot bring anything good to the people for it unleashes vile and baneful passions. The Church’s stand in this situation should reflect not some momentary preferences of particular people but God’s truth without which the true people’s common good is impossible. The Church will always defend God-given eternal values on which the life of our peoples, heirs of historical Rus’, has been built for centuries and we believe will be built. It is only on these values that people’s dignified life can be founded. Only these values will give a future to the Ukrainian people. And for this reason the historical choice of the Ukrainian people should not lead to the destruction of these unchangeable and saving values. We call upon all to remember: the emancipation of morals will with time fully destroy a people, depriving their and each one’s soul of purity and integrity. As far back as the 4th century, St. John Chrysostom warned: “When families are broken, cities and states will fall”. It is as if the voice of the teacher of the Early Church speaks to our contemporaries. And the holy martyr Metropolitan Vladimir (Bogoyavlensky) of Kiev and Galich noted in his works: “The whole human society is based on the family and in it, like a building in its foundation, it finds its solidity and stability”. That is why it is so important today that we stand for the immutable, God-given moral law concerning both family life and all the spheres of human existence including that of the development of society and state. We call all pastors and the flock of our Church to pray and see to it that the people of Ukraine, just as all the fraternal nations of spiritually united Holy Rus’, may order their life according to God’s truth, peacefully and devotionally. On the threshold of the Nativity of Christ, we extend our love to all of you, dear brothers and sister, and wish that you may preserve peace in your hearts, remembering that witness to peace was the first good news proclaimed by the angels in the night of the birth of Enfant Christ: “Glory to God in the highest, and on earth peace among men with whom he is pleased!” (Lk. 2:14).